The recently announced Tasktop Pro 1.6.1, which features a connector for Eclipse Mylyn and ThoughWorks Studio's Mingle. 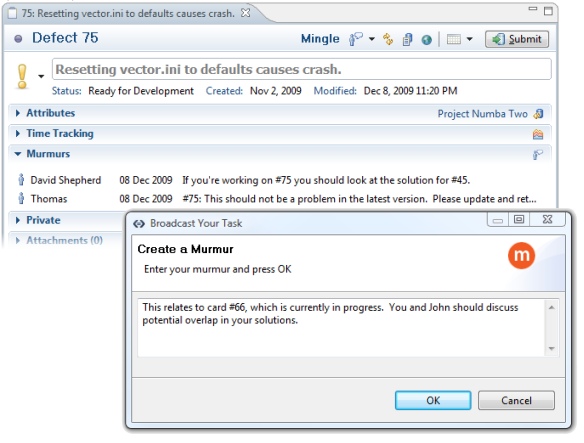 The new tool integrates application task management in Eclipse and project management through Mingle 3.0. With the new release, developer teams can access Mingle directly from any Eclipse-based IDE or from a stand-alone desktop application with offline access. Speaking of Waves, ThoughtWorks Studios said in November that they intend integrate Mingle with Google Wave. The full integration will be available once Google Wave reaches its final release next year. Mingle cards have already been integrated with Wave and they are also accessible in the Tasktop integration. From the Tasktop task list, cards can be activated for automatic tracking of the most relevant source code for bug fixes. Tasktop even allows you to come back to those bugs after an interruption. The integration eliminates the need to toggle between browser, email, and IDE to gather information. With Mingle, Tasktop also gains Subversion 1.6.5 support and improved Mingle APIs. The Mylyn Mingle connector brings the two layers of project management and task management together. Besides having a Mingle integration, Tasktop Pro and Tasktop Enterprise add significantly more functionality to Mylyn. The 1.6 version of Tasktop Pro includes Task Federation support, which allows linking across task repositories, importing features, and migration features. That means, for example, it can link a user story in one system with defects in another system. The time tracking on Tasktop Pro now allows easier adjustments and C/C++ is also fully supported in the new versions of Mylyn and Tasktop. To vote for additional connectors for Tasktop, you can go here. Future integration with ThoughtWorks Studio's Twist test automation and Cruise release management products will be available in March 2010. You can sign up to be notified about further integrations. A free Tasktop Pro trial is also available.